Chris Sayers was shot about 7:10 a.m. near West 59th Street and 11th Avenue, officials said. 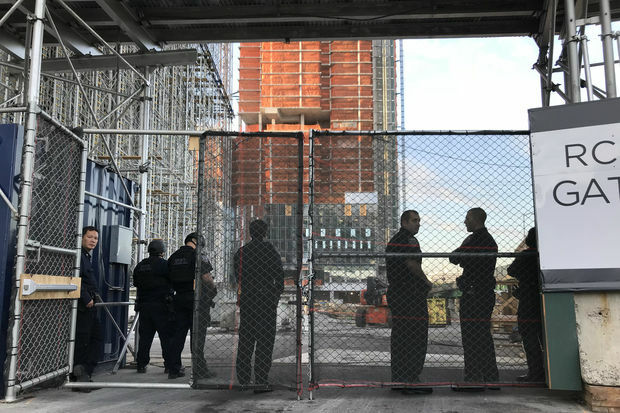 UPPER WEST SIDE — A disgruntled construction worker returned to the luxury high-rise jobsite where he had been fired days earlier and fatally shot the foreman in the head Thursday morning before turning the gun on himself, NYPD officials said. The 44-year-old carpenter, who neighbors and law enforcement sources identified as Samuel Perry, shot his former boss, Chris Sayers, 37, in the head at point-blank range about 7:10 a.m. on the 37th floor of 645 W. 59th St., near 11th Avenue, police said. Police said Perry fired multiple shots, but witnesses heard only one. "I just heard one shot. That was it. It was really loud — just one pop. Everyone started running. Everybody was yelling, 'Someone got shot,'" recounted Ed Capaldo, 37, a worker at the site. "It was complete chaos," he added. On Monday, Sayers fired Perry for insubordination when he flew into a rage after being told to redo a wall he had constructed, witnesses said. Robert Pagan, 42, was working four floors below where the shooting happened and went up to investigate after hearing a gunshot. He crossed paths with Perry without realizing he was responsible, even joking with him after hearing the gunfire. "I actually hugged him on the way down, not knowing he had done it. He was very casual. I said, 'What's going on?'" Pagan said. "I asked, 'Are you bringing guns to the job?' He said, 'No Spider, I'm going home,'" Pagan added. Pagan then found Sayers lying dead on the floor. "I checked his pulse, but it didn't seem like he had one. He was face down," he said. Investigators found two 9mm shell casings nearby, police said. "They actually got along really well. Chris gets along with everybody. [Perry] is a good guy, too, but he's a little crazy, a little hot-headed," Pagan added. Sayers, of Long Island, was pronounced dead on the fifth floor about 8 a.m., while the gunman, who was from Far Rockaway, was found dead nearby from a self-inflicted gunshot wound, police said. The victim's family was heartbroken by Sayers' sudden death. "He was a big teddy bear," said a man who identified himself as the victim's father when reached by phone Thursday morning. "When his mother was dying, he quit his job and stayed with her day and night," added the man, who didn't provide his name and declined to speak further. Perry has been arrested three times before, including for two assaults and a burglary, according to police, who didn't provide further details on those arrests. A neighbor of Perry's on Gipson Street in Far Rockaway said the shooter approached him on Wednesday and asked if he could watch his dog. "He basically said if he can't find no one to watch his dog, he's gonna shoot his dog in the head and bury his dog," said the 44-year-old neighbor, who only gave his first name, Mike. "There was no indication to me that he was going to do something, but it did seem strange that he said he was gonna shoot his dog in the head if he couldn't find no one to watch him." Co-workers also told investigators that the suspect was "a bit of a hot head," police said. Police initially used their active shooter protocol when responding to the scene, but changed tactics once they realized what had happened. "Once we figured that out, we then had to do our search for the perpetrator and we started floor to floor," said Emergency Service Unit Captain Thomas Traynor. Police said their investigation continues. "We're still looking to find out how he got back into the building. We do have video of him going in the first floor, but no other video inside the building," said Brian McCormack, chief of Manhattan North Detectives. The work site will become Waterline Square, a luxury development that's already selling units for millions of dollars.